WASHINGTON — Call it the Tale of Two Summits. 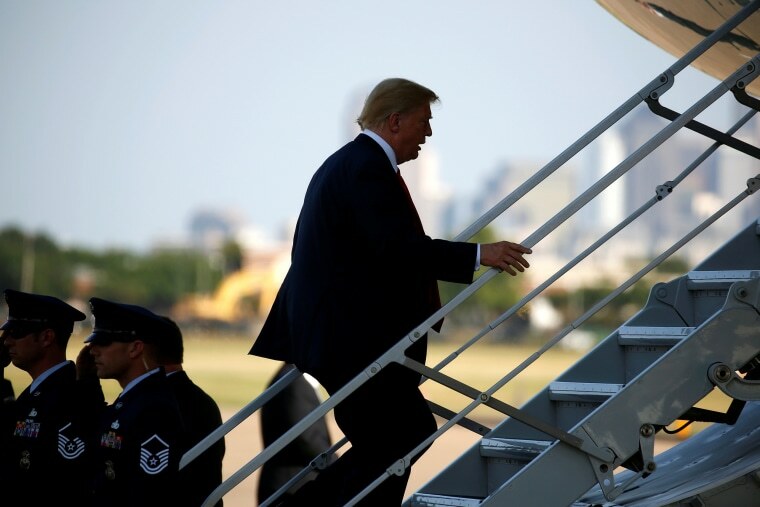 President Donald Trump today heads to Canada for the G-7 meeting, where he’ll get a frosty reception from the leaders of Britain, France, Germany, Japan, Italy and Canada, who are upset with the president’s tariffs — as well as his withdrawal from the Iran nuclear deal and the Paris climate accord. Then tomorrow — after cutting his trip to the G-7 short — Trump heads to Singapore to begin preparations for that North Korea summit on June 12. And from his tweets and public comments, you can tell which gathering Trump finds more appealing. He’s lashing out at allies like Canada and France. “Please tell Prime Minister Trudeau and President Macron that they are charging the U.S. massive tariffs and create non-monetary barriers. The EU trade surplus with the U.S. is $151 Billion, and Canada keeps our farmers and others out. Look forward to seeing them tomorrow,” Trump tweeted last night. “Prime Minister Trudeau is being so indignant, bringing up the relationship that the U.S. and Canada had over the many years and all sorts of other things...but he doesn’t bring up the fact that they charge us up to 300% on dairy — hurting our Farmers, killing our Agriculture!” he added. On the other hand, Trump is praising North Korea’s Kim Jong Un, whose fav/unfav score in the new NBC/WSJ poll is 3 percent positive/72 percent negative. “I really believe that Kim Jong Un wants to do something. I think he wants to see something incredible happen for the people of North Korea,” the president said yesterday. That isn’t a happy senator from Iowa, whose gubernatorial race this fall between incumbent Republican Gov. Kim Reynolds and Democratic challenger Fred Hubbell could be a canary in the coal mine on the political repercussions of Trump’s trade battles in farm country. Remember, Iowa has typically been a good indicator of the country’s mood. At the end of the Bush Era, it was open to Barack Obama’s “Hope and Change” message. At the end of the Obama Era, it turned against Hillary Clinton (she lost the state by 9 percentage points). And the gubernatorial race could shed some light on how Trump’s tariff policies are playing out in rural America. A day after our NBC/WSJ poll showed that health care was the top issue heading into the midterms —and one that especially fires up Democrats — comes this news. Finally, don’t miss this additional story from our new NBC/WSJ poll: “Among registered voters of all political stripes, two-thirds (67 percent) say that the country would be better off if more women were elected to political office, while just a quarter of voters (24 percent) disagree. But it's among Democrats that the pro-female candidate sentiment is most overwhelming. Nearly nine-in-10 Democrats (87 percent) say the country would be better off with more women in office, while 10 percent disagree,” one of us writes.